I've heard mention of a whale being a problem for the Benn. Can someone relate the tale of the whale for myself and others not familiar with the story. During World War 2, Bennington was taking part in air strikes against Okinawa, and routinely was retreating back to sea, when Japanese Navy forces appeared in the area. The Task Force was making good time, when all of a sudden Bennington started slowing down, unable to keep up with the other ships, even though they were "full speed ahead" It soon became apparent that the bow of the Bennington had rammed and IMPALED a whale on the bow, causing the great drag. The ship came to a complete stop and they backed down the engines, trying to dislodge the whale. Meanwhile Japanese Navy Ships remained in the area. 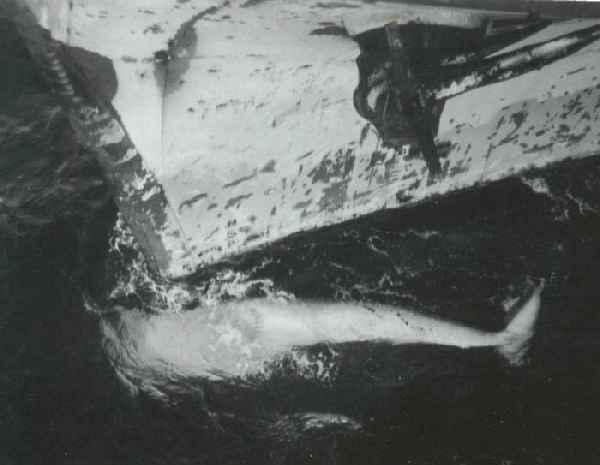 Faced with no other choice, the ship came to a complete stop and divers went over the side of the ship to use small explosives to finally dislodge the whale carcass.